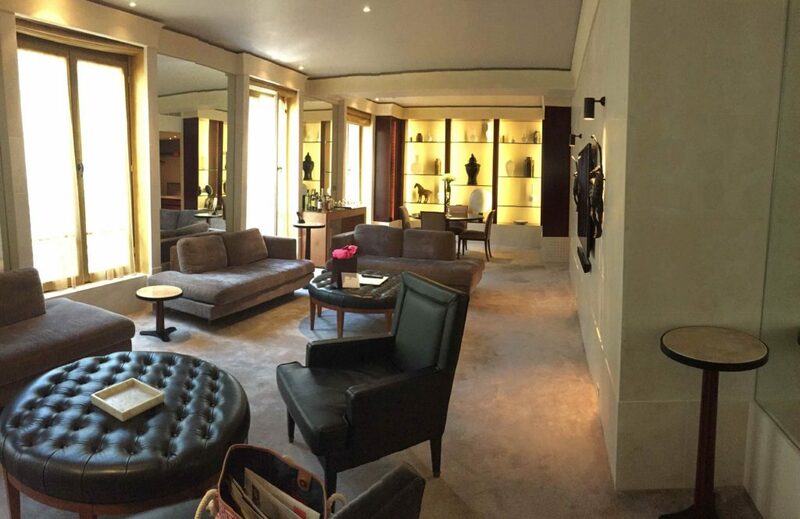 On my last visit to Paris I was upgraded to a ridiculous ambassador suite at the Hotel Le Park Hyatt Paris Vendome. And when I say ridiculous what I really mean is fabulous. A short walk from the fanciest shops and most popular attractions, this new-ish hotel certainly didn’t disappoint. The massive one-bedroom suite had a living room, dining room and two (or was it three?) bathrooms. In fact, the lid to the warmed toilet seats automatically opened when I stepped in front of it. For real. Nice (unusual) touch. I was in Paris to research hotels that have been designated Palaces de France, or palace hotels. 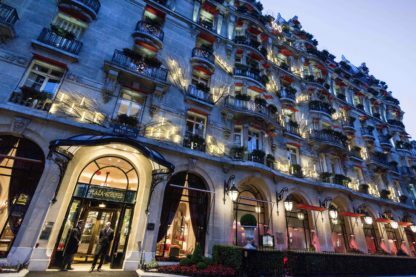 The ultra-luxury category was created in 2010 by the French Tourism ministry to separate the most regal hotels in France from those poor five-star properties. As of 2017, there are 23 palace hotels in France and, not surprisingly, 10 of them are in Paris. I suspect that number will rise by two in the near future given that the list does not include the legendary Ritz Paris or the historical Hotel de Crillon. Both are spectacular but recent renovations precluded them from the long palace review process. This posh property in the heart of Paris completed a six-year renovation in 2014 and it shows. Extravagant furnishings, Carrara marble floors and gilded ceilings set the mood and its three-Michelin-starred fine dining restaurant, Epicure, seals the deal for luxury. Scenes from Woody Allen’s Midnight in Paris were shot here and guests have included Orson Welles, Grace Kelly and many others. It doesn’t hurt that Bar du Bristol, the hotel bar, has been voted best bar in the world. Belly up. 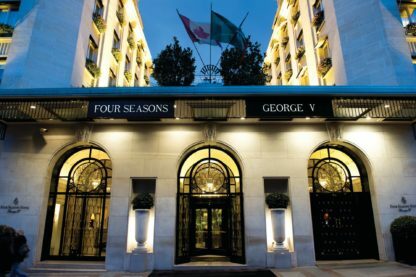 Four Seasons George V, the Ritz and the Plaza Athénée are basically the trifecta of luxury in Paris. The art deco lobby of George V is a stunner, particularly given the infamous floral designs that decorate the public spaces. In fact, it's estimated that the flower budget alone exceeds a million dollars annually! The rooms are lavish with traditional French furnishing and impressive chandeliers. Guests can even request use of the property's Rolls Royce to get around Paris. Chéz magnifique! 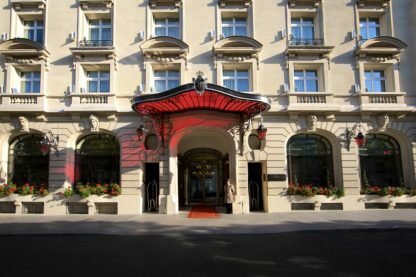 The Plaza Athénée, on chic Avenue Montaigne, is one of the city’s most sought-after properties with its iconic red awnings announcing its grandeur to arriving guests. Being over 100 years old, it’s not surprising they recently completed a substantial renovation. In addition to other upgrades, they added a new tower with 15 additional rooms and suites with views of the Eiffel Tower, not to mention eye-popping decor and state-of-the-art technology. You can even cuddle with a specially-designed red hotel teddy bear. 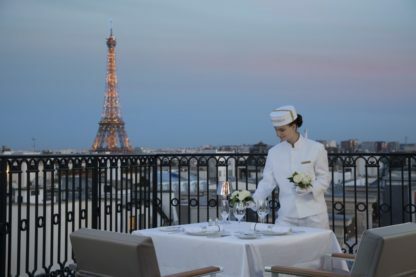 One of Paris’ newer palace properties, the Mandarin Oriental is quickly making a name for itself as an option for those who want the palace service but with a more modern, less-stuffy environment. The Asian-styled design of the interiors are sleek and warm, with a butterfly theme that winds its way through the rooms and hallways. The sleek property also features the art of Man Ray, a Paris resident in the early 1900s. 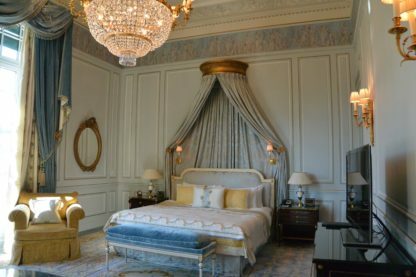 The two-story Royale Mandarin suite, with views of the Opera Garnier, is a spectacular. 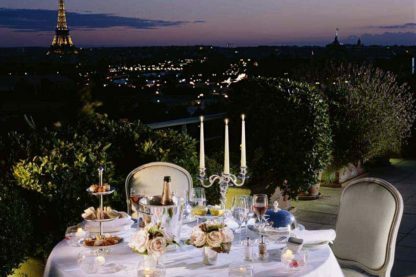 Set alongside the beautiful Tuileries gardens on Rue de Rivoli, a short walk from The Louvre, Le Meurice is another grand dame of the palace hotels. 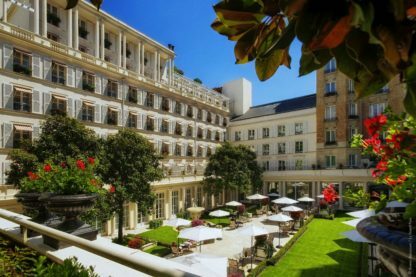 Sister property to the Plaza Athénée (both owned by the Dorchester Collection), it continues to be considered one of the most elegant hotels in the world. A 2016 refurbishment incorporated interior styling by Philippe Starck, with each floor having its own theme. Originally opened over 200 years ago, guests have included the likes of Salvadore Dali, Anna Wintour, and “Queen Bey” Beyonce. Although open for only 15 years or so, this hotel has made strides in establishing itself in the luxury scene by providing excellent service and more or less doing its own thing. The slick, toned-down interiors offer a more contemporary feel, perhaps more American than French. That doesn't mean it isn't top-notch. In addition to excellent service, features include artistically-designed light fixtures and doors handles, bath and spa products with a signature scent by perfumer Blaise Mautin, and an inviting bar scene. Even the bar snacks (addictive fennel toffee almonds) are a cut above. 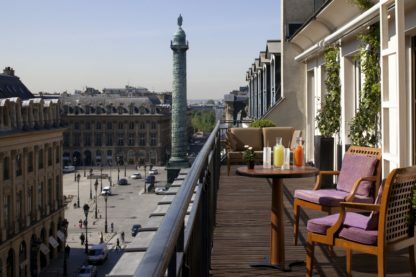 It’s been about a year since the Peninsula Paris received its palace designation, having only opened in 2014. Given its opulence, it seemed obvious that’s where it would lead. The building, which takes up an entire city block, was once home to UNESCO headquarters and it was here that the Paris Peace Accord brought an end to the Vietnam War. On a happier note, it’s also where Gershwin penned An American in Paris. After a four-year build that incorporated updated tech options (hello iPad controls), the Peninsula also offers some of the largest rooms in Paris. Five of the 34 suites include rooftop gardens and, for those without, the L’Oiseau Blanc bar and restaurant offer killer views of the city. There is a cadre of privileged travelers who seek out the little-known La Réserve properties because of its commitment to providing a holistic, bespoke experience. La Réserve Ramatuelle was the first in this brand to receive the palace distinction and the Paris sister property now has one too. 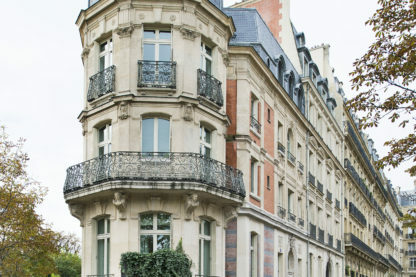 Privately owned by one really wealthy guy, this beauty is housed in a Haussmann-designed building that was once the home of Napolean’s half-brother. It sits a few doors down from the presidential palace and has only 40 rooms and more than half of them are suites. 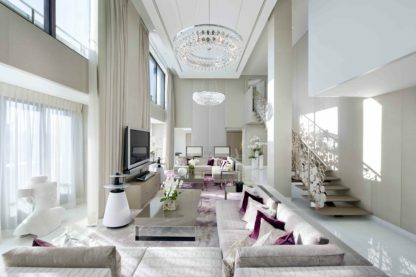 In fact, one two-bedroom suite has 14 floor-to-ceiling windows with views of the Grand Palais and Champs Élysées. Yes, please! Situation not far from the Arc de Triomphe, Le Royal Monceau offers luxury with an art deco twist. Opened in 2013, the hotel received the palace distinction three years later. Again, the interior design is by Philippe Starck who has added eccentric touches that you won’t find in many palace properties. These include an art gallery, bookshop, mobile sound studio, a cinema and a cigar lounge (natch). There’s also a concierge whose role is to help guests discover the modern art of Paris. Très avant-garde. Who wouldn’t want to sleep in a hotel that was once home to Prince Roland Bonaparte? This 18th-century stunner is just a stroll away from the Eiffel Tower and the Seine. Bonaparte’s personal bedroom has been converted to an elegant suite sure to impress any discerning luxury traveler. But don’t expect a view of the tower (Bonaparte reportedly hated it). With a hat tip to its Asian roots, a staff member of the Shangri-La will personally deliver and pour your tea in your room upon arrival. Or opt to have it in one of the spectacularly-refurbished salons or sitting rooms.